﻿ Book Chateau Mygo Villas (Marigot Bay) - 2019 PRICES FROM A$196! 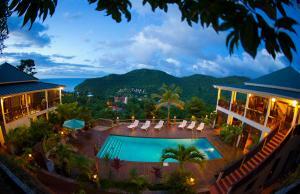 With a private beach area and an outdoor swimming pool, Chateau Mygo Villas is located in Marigot Bay and has free WiFi. Each unit comes with a fully equipped kitchen with a microwave, a seating area with a sofa, a flat-screen TV and a private bathroom with bidet. There's also a toaster, fridge and a coffee machine. Guests can dine in the in-house restaurant, which serves Caribbean and Indian cuisine and also offers vegan and gluten-free options. The vacation home has a grill. Guests can relax in the garden at the property.